Identify (or ID) is a function in Diablo that players must use on an unidentified item before it can be used. To identify an item right click on it, or use the Identify All book in town. Demon Hunter identifies while Cain watches. Many items when first found from monster drops, chests, or other clickable objects are unidentified. The items show their basic item type and item level, but not the specific stats. Some legendary items can be identified by their unique graphics or their item type and level, but the wide variation in legendary items still requires them to be identified to know if the item's roll is good or bad. Only Rare, Set, and Legendary items, found from monster drops, need to be identified. Magical (blue) items do not need to be IDed. (They did in Diablo 1 and Diablo 2.) Rare and Legendary items created by crafting do not need to be identified. Patch v1.08 added the Identify All option which allows players to identify every item in their character's inventory in just a few seconds. This new feature saved a great deal of time over clicking each rare and legendary item individually, and was welcomed by players. Identifying items in Diablo 3 does not require a scroll or book; it's an inherent character ability and only requires a right click on the unidentified item. 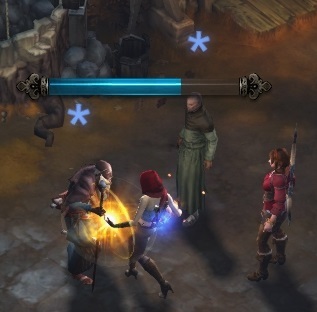 This is a change from previous games in the series, and during much of Diablo 3's development scrolls were required for this function. While identifying the character goes into a casting animation and a progress bar appears overhead. The time required to identify has been reduced in patches; Rare items were initially 3 seconds each and Legendaries were 5 seconds. In patch 1.0.5 these timers were reduced to 1 and 4 seconds, respectively. Due to the huge variation in the quality of identified items and the ease of selling them via the Auction House A market for selling unidentified items has grown. This exists largely for top end legendaries such as the Echoing Fury (db) mace or the Mempo of Twilight (db) helm, which can be worth billions of gold with a good roll, or nearly worthless with a bad roll. The sale of an unidentified item is a gamble for both parties. The seller is taking a price that's better than most rolls of that item would yield, but giving up the chance at a jackpot. The buyer is paying more than the item is worth most of the time, but hoping for a super roll that will be worth a fortune. Unidentified items can not be sold via the Auction House, so such transactions must be arranged via chat channels or through third party sites. Item stats are set the moment the item is generated, and are based on the monster or object that drops the item, the item level, and the character's Magic Find. How or when a player identifies an item has no effect on the stats or the quality of the roll, and any superstitions to the contrary are unfounded. ID scrolls were seen in the August 2010 Gamescom demo. and also in that year's Blizzcon demo. The major changes to the system came during the beta, with blue (magical) items changed to not require identification. More changes came in Beta Patch 10, when identify scrolls were removed from the game, and characters were granted the inherent ability to ID items with just a right click. NPC assistance is not required for item identification, since characters now have identification as an inherent ability. This process required scrolls during most of Diablo III's development, but those scrolls were removed in a major game system overhaul in January 2012, and players were given the inherent talent. To use it, a character need simply right click on any unidentified item, and after a short (two second) status bar, the item's properties are revealed. 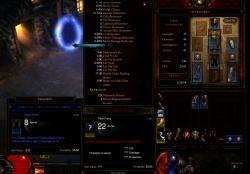 The system for identifying items has changed repeatedly during Diablo III's development. Bashiok reflected that principle when he commented on the many options for Identification in a forum post from February 2009. The identify system has gone through quite a few internal iterations already, and I think we’ll probably see quite a few more. It’s an interesting system in a lot of ways because first off it’s something everyone remembers from the previous games, so if it wasn’t there you’d probably wonder where it went. In a different light you could literally remove it entirely and probably not impact gameplay itself very much at all. It’s also open ended enough where you could blow the system out and do something new and cool with it. Ultimately (and I know it’s a broken record at this point) we’ll do what is best for the game and what adds to the best game experience possible. Personally – my own personal thoughts on the system – are that I think you could do almost anything with it and I’d be just fine. It wasn’t annoying to me when playing the previous games, it was just a part of how they played, if it was removed I don’t think I’d really miss it either, and if it was changed for the better then that’s cool too. In response to player feedback Patch 1.0.5, released in October 2012, reduced the time it took to identify items. Identify All was added in Patch 1.0.8 in May 2013. Identifying all magical (or better) items was a standard feature of the series prior to Diablo III. Diablo I required players to use Identify Scrolls or to consult Deckard Cain to find out the stats on magical items and unique items. (There were no set or rare items in Diablo I.) Identification from Cain cost 100 gold per item, and unidentified items could be equipped, though they did not grant any bonuses (or penalties, as cursed items were found in Diablo I) until they were identified. Diablo II continued Diablo I's system, with all magical and unique items, as well as the newly-added set and rare items requiring identification. Tomes of Identification were added, allowing up to 20 scrolls to be "stacked" for convenience, and Deckard Cain was still the town identification NPC, now doing it for free after players rescued him from ruined Tristram in an early game quest. Any object imbued with magic exhibits an aura that is easily noticed. To determine the exact nature of this enchantment, however, requires intense study and an extensive knowledge of arcane materials and symbols. It's extremely difficult to master the ability to memorize a spell of this magnitude but the Vizjerei mage clan have developed a means for the untrained to discover the secrets of an ensorcelled object by using a rare crystal that is extremely sensitive to magical auras. This sensitivity makes it very fragile, however and the crystal will shatter if it is brought too close to an enchanted item. The very act of Identifying such an object also destroys the crystal. Scrolls and staves have been crafted and imbued with the spell that identify virtually any magical aura. By using special inks and dyes that contain tiny grains of these crystals, the stability of the crystal is maintained until it is used to examine the enchanted object. This page was last edited on 14 June 2013, at 19:04.